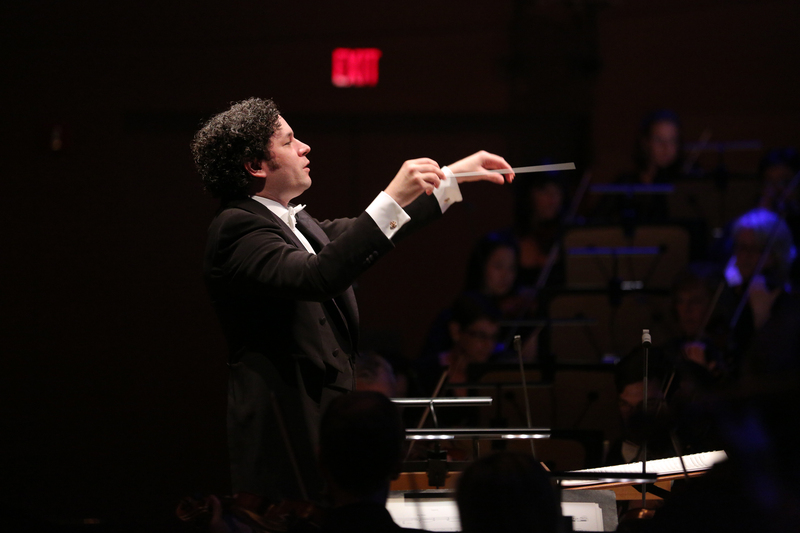 Review: Dudamel, L.A. Phil give epic Mahler. Orange County Register, Oct. 3, 2014. Blaming improper balances on string seating arrangement seems odd to me, considering that the same configuration was not only used for all rehearsals in preparation of the reviewed program, but was in fact utilized by the orchestra for most of its 11+ years in this hall. Unless all of those many hundreds of concerts were equally poorly balanced, and i don’t recall anyone claiming so, there must have been some other reason for your dissatisfaction with that aspect of the performance last week. Mahler’s orchestration sounds different depending on how the orchestra is seated, which also has an effect on balances. In one simple case, the second violins are not as loud when they are sitting on the right of the conductor (not as loud for audience members sitting in front, that is). This means that some other sound comes through with greater presence. Also, having the basses and cellos on the left, away from the low brass on the right, definitely “spreads out” the bass sound over a wider area, and therefore lessens it in a sense. There isn’t the resonance that both groups get from close proximity. As I said, the way the LA Phil was seated is probably better for overall clarity. But clarity is not necessarily the be-all and end-all of the piece, and is probably achievable at any rate in Disney’s acoustics with other types of seating. You may be absolutely correct. Or you may be at the very least partially correct. For example, “spreading out” lower frequencies may make their sound more enveloping (“embracing”, so to speak) rather than diminish its impact. But in any case, all of this does not in any way respond to the gist of my thoughts about it expressed in my original comment here. Actually, at least in this case, the lower frequencies weren’t more embracing, not to me. They were thinner. Bruckner and Mahler (other composers as well) use the double basses and the low brass together in a very effective way. The double basses serve to boost to sound of the brass; it seems to do something to the overtones, or, whatever it is, the brass sound becomes more like an organ. Ask any low brass player if they’ve played Bruckner or Mahler with the double basses sitting next to them, and they will say it’s a unique sound and experience. Apparently my comments are not clear enough which perhaps “may have had as much to do with the” order of letters my keyboard sent to the computer “as anything”. Looks to me like a classic case of misunderstanding between two people who are speaking about slightly different concepts: one keeps explaining Direct Cause with which the other has no serious dispute while that other keeps hoping to see Ultimate Responsibility being mentioned. There is essentially no argument here. I don’t really know that there is anyone to blame. Yasuhisa Toyota, Gustav Mahler (he did have a lot of trouble orchestrating the 5th), Gustavo Dudamel, Johann Sebastian Bach, the designers of instruments, the musicians themselves? I think mostly I was just expressing a personal preference for different seating in this particular piece. But others, maybe a majority, probably prefer the way it was. The issue is very clear to me but i have said more than enough already.